Here we go friends, get ready to clear the clutter from your home! Paperwork can easily become the biggest source of clutter. We will be visiting paper clutter a couple times this month, because it is such a problem for most of us. It is important to make sure your home has a functional system for all bills and additional paperwork that come through your door. I know when I walk in the kitchen and see piles all over the counters, I am immediately tense and stressed out. Enter: filing! I do not know why I haven’t thought of this until recently. It makes a world of difference. Scan and archive as much as you can and switch to online bill-paying to cut back on junk mail and paperwork. When mail arrives, open and sort it immediately, keeping a trash bin and shredder nearby so you can discard junk then and there. Use electronic subscriptions for magazines so you can read them from your tablet and cut back on even more paper. It can be difficult to “let go” of paper. Scanning and archiving can take some getting used to. Once you start to cut back on paper, you will be amazed at how much freer and in control you feel. Sort and declutter. Gather the paperwork lying around the house in order to sort and declutter. Now, since we will be revisiting paperwork, I suggest starting today with the 1-2 rooms that will make the biggest difference. My room will be the kitchen, since that is where most of my papers are. Switch to online bill pay. Contact all of the companies that send you a monthly bill and find out if they offer online bill pay. Insurance companies, credit card companies, and utilities almost always offer e-statements. Contact yours and switch. Eliminate junk mail. Contact all junk mail senders and ask to be removed from their list. Discard junk mail immediately (before it ever hits your desk or any other surface in your home). Bank online.If you don’t have it already, set up online banking and request electronic statements. Shred and discard.Get rid of all items that are no longer relevant. There! How does that feel?! I know this is a tough one, but that is why I wanted to get it out of the way! Don’t forget to use the hashtag #SimpleHomeChallenge and share your pictures! I love how you are going about this. I have some serious decluttering that I need to do at my house, too. I should start before it gets worse. This is definitely something we need to do. Right now I just keep all of our bills in a folder at my office. Probably not the most organized but I know where they all are! This needs to happen in my life, my desk is starting to look like a very chaotic library. I have a project for tomorrow now! My kind of post! You know I love organization, but this is an insanely thorough list, great job! I am actually very organized with everything except for paperwork haha. Time to get to work on it! Lol, thanks Cate! Hope you find a few tips you can implement. I always feel SO much better when I’m on a decluttering mission, especially with paperwork that has just built up! I hear you Katie! That’s why I thought starting with papers would be so beneficial, it makes a huge difference! What a great thing to start at the beginning of the month. I always think I will start to organize and declutter at the beginning of the year. What better time to start than now. 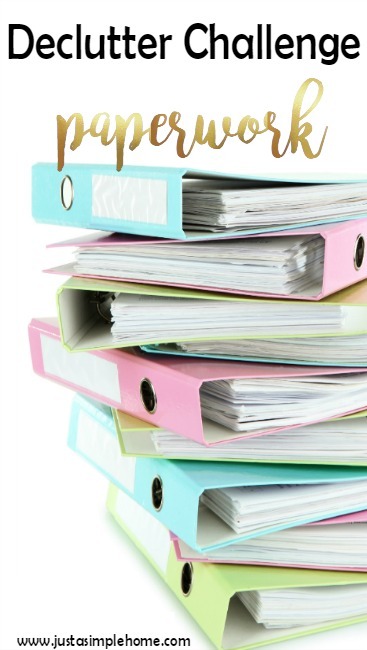 There are some great tips regarding what to do with paperwork. I will have to get up in my office and get started. Thanks Cynthia! I know, it’s typical to think about organizing come the New Year, but I have been itching to do some decluttering for the summer. Hopefully, it will make fall that much smoother! This is so cool. It’s the wrong time of the year for me, but I love it. I would like to go through my stuff in my study and organize all of it! Great tips! Most of my mail goes directly in the garbage – such a waste! I wish I wouldn’t get so much junk to begin with. That’s part of today’s task…unsubscribe from your junk mail! I love this! I am in the process of decluttering after our move–so this will be very helpful! I’m pretty good about clutter, especially paper. I can’t stand messes around so I toss everything. Sometimes too much! Great tips! I’m constantly purging stuff like this. Scanning important items that need to be kept, donating items that are no longer needed and trashing things that have seen better days! Ok I am in! I need to REALLY get on this. It’s amazing how quickly things get cluttered up! Oh, I am so glad Reesa! Hopefully after this month, you’ll have less stuff hanging around. I despise paperwork, and I despise decluttering it even more! However, I always feel better after decluttering it. These are great tips! I love a good decluttering challenge! Great idea to take on decluttering on day at a time. I’m always trying to keep my clutter to a minimum. It drives me crazy to have too many papers and junk lying around. These are great tips! I so need to at least throw away some old receipts that my husband has from years ago somehow. Love this! I have a really issue with paper around the house, to the point that when our printer died hubby didn’t want to replace it so there wouldn’t be things I’d printed out all over. Great tips. Good tips! I have developed a habit of completely clearing off my desk about once every two weeks, and that has been so helpful. It also makes me feel like I have one little place of peace and order, no matter what the rest of the house is doing. Sounds like a wonderful challenge that will be helpful to so many. Bill paying is a great place to start. Yes, paper can add up. I recently purchased my magazines…I was sad to see them go, but there is no reason to keep a hold of so much outdated material anyways. I like the idea of scanning information…that would really help in my case. Oh don’t, I have so many pieces of paperwork that need to be sorted and not enough time to do it in. I need to learn to let go of things and not be such a sentimental fool. I’m currently in the process of shredding some bills and paperwork that I have been hanging on to. I think I was holding on in case I needed these papers but I haven’t needed them for anything actually.